The Insulspan® Structural Insulated Panel (SIP) System is an industry-leading, ready-to-assemble (RTA) system. It provides homeowners, builders, architects, and timber framers a competitive edge over traditional stick frame construction. The RTA process reduces construction time and improves efficiency from beginning to end. 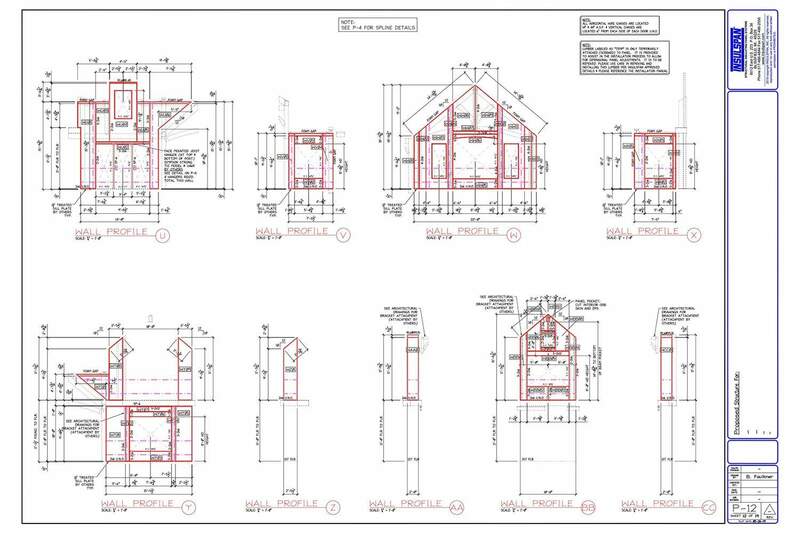 Insulspan’s experienced design team produces precise SIP drawings based on your plans using HSB AutoCAD. 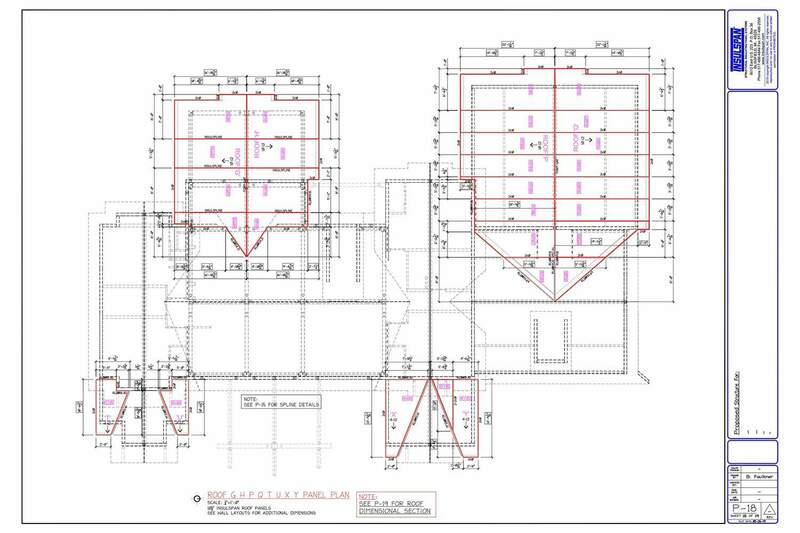 These detailed drawings include all panel configurations along with ridge and purlin details, deck connections, panel connections, sealant and fastener details, header and lumber details, and joint tape details. 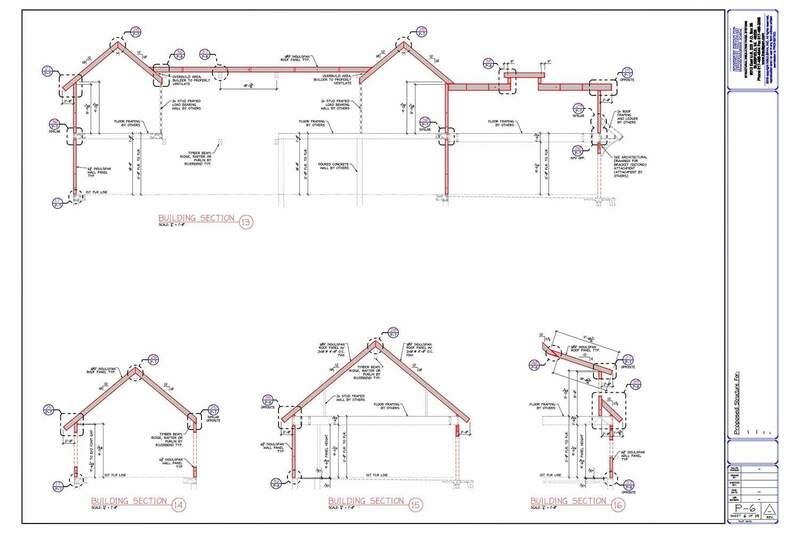 To view example pages from a set of construction drawings provided by Insulspan, click on the image to the right. 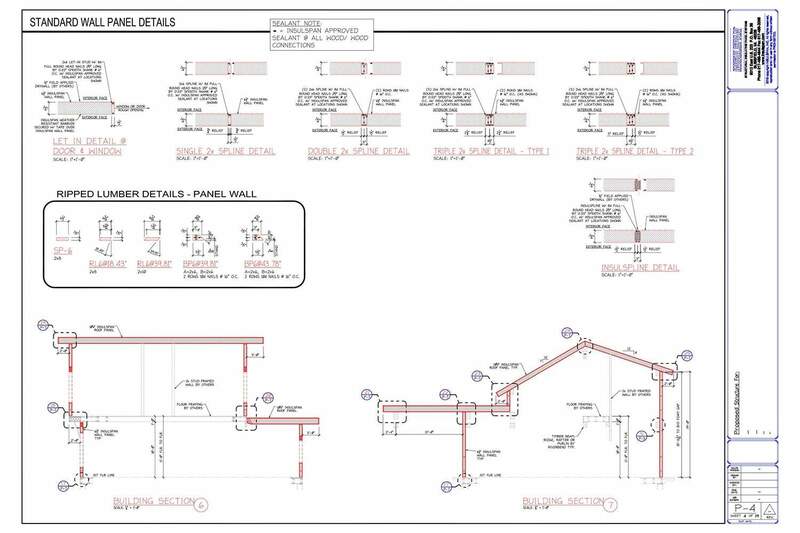 During the design process, we optimize the panel package for your residential or commercial building. This ensures your panel package gives you optimal panel usage as well as speed and ease of construction. 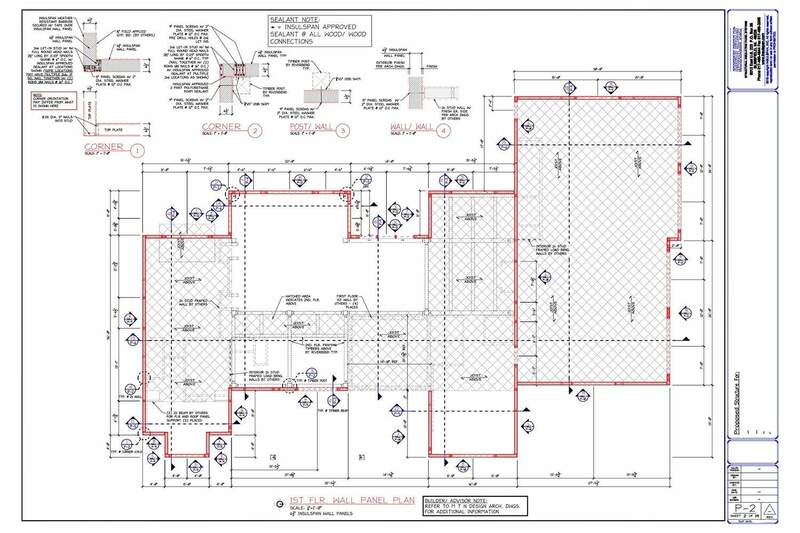 Our detailed construction drawings accompany the SIP package to your job site. The Insulspan Installation Guide is also included. 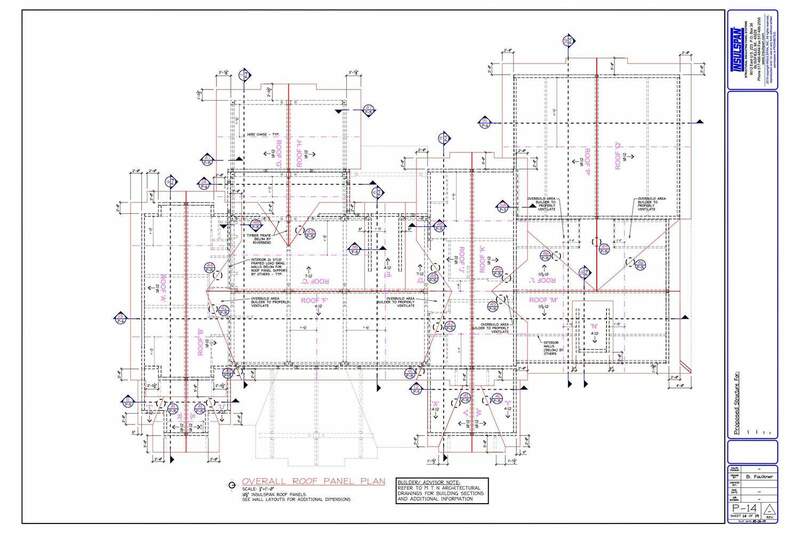 Using detailed shop drawings created by our design team, panel manufacturing begins with pre-cutting per your specifications and takes place in our controlled environment. Our manufacturing includes all straight, miter, and bevel cuts needed for the eaves and rakes as well as openings for doors, windows, and skylights. As a result, you will not have to cut the panels on the job site (unless the foundation or architectural plans deviate from the original estimated contractual plans). Finally, all lumber components that can be installed prior to delivery are, including window and door bucks and connections as well as corner and structural spline connections. What About Electrical Wire Chases? Panels include standard, pre-drilled wire chases at 14″ and 44″ above the floor and 6″ from door openings on both sides. Need additional chase locations included in your panels? You can easily add them during the design phase, and we include them in your panels’ manufacture. Common locations of custom wire chases include: ceiling fans, ceiling lights or chandeliers, walls sconces, and outlets at vanity height in bathrooms. 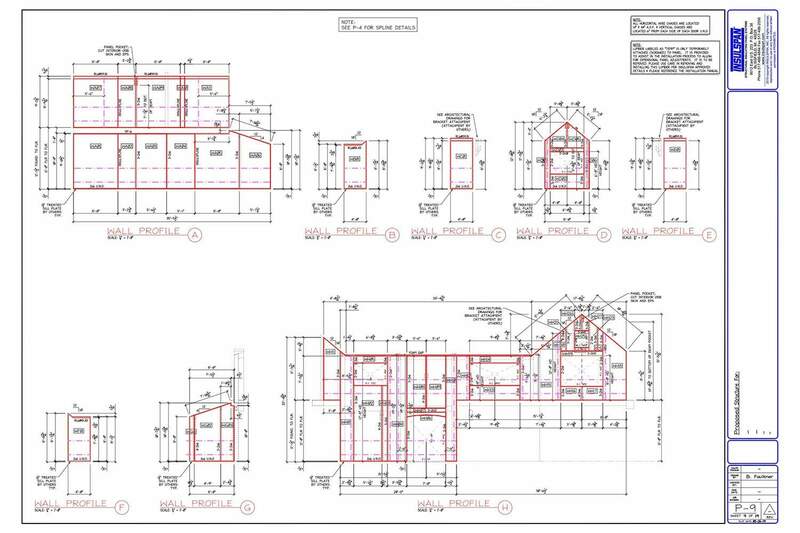 As part of our design process, our design team develops a roof support system based the structural and engineering needs of your residential or commercial project. 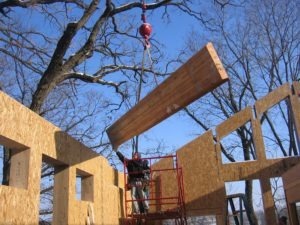 Then, we supply the architectural-grade glulam beams to install at the roof’s ridge, hips, and valleys. 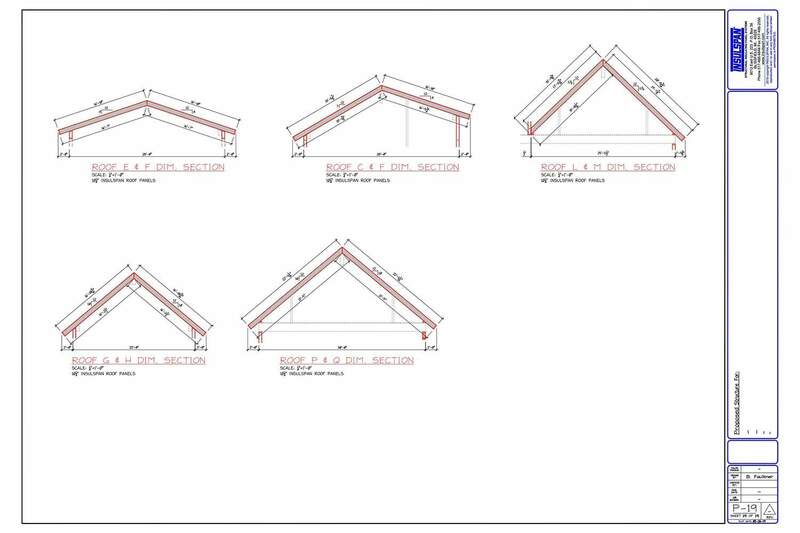 We will also supply glulam purlins if the plans call for them. All glulams are cut and beveled before delivery to you. 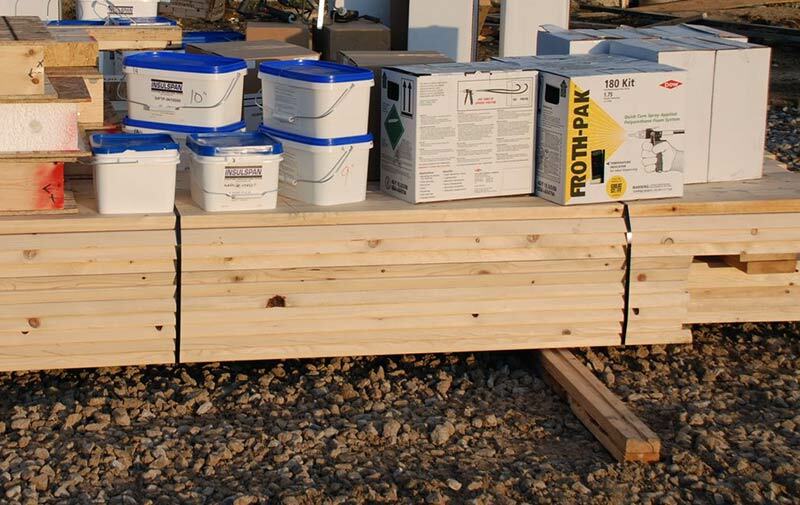 The Insulspan RTA SIP package arrives just in time for installation based on your established construction schedule. Your panels arrive pre-prepared for sub-trades. 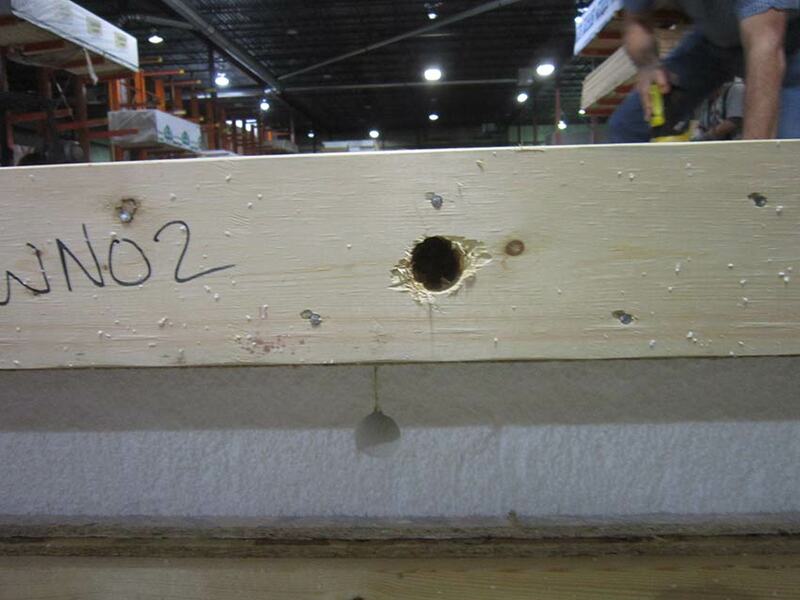 This means when the panels arrive on your site, they have labels, lumber installed, and wire chases cut. 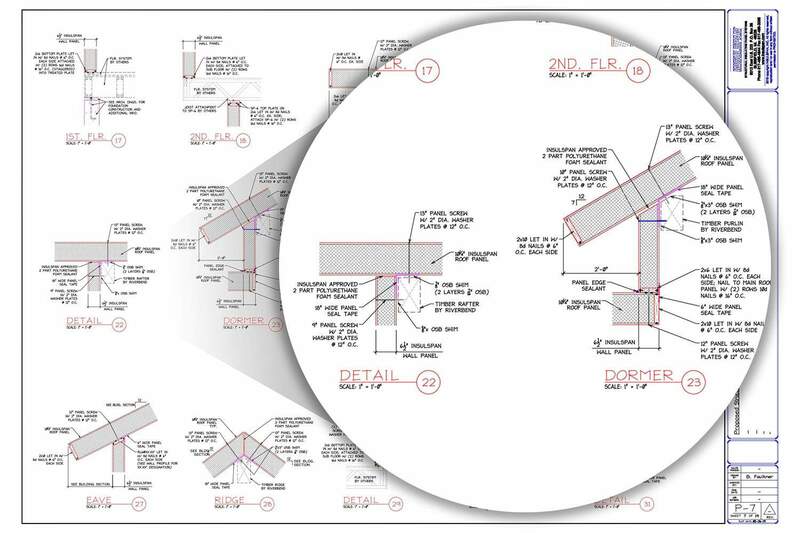 Construction drawings accompany your panels, showing you the panel locations based on the numbers and letters on each panel. Simply assemble the panels in order based on the drawings. 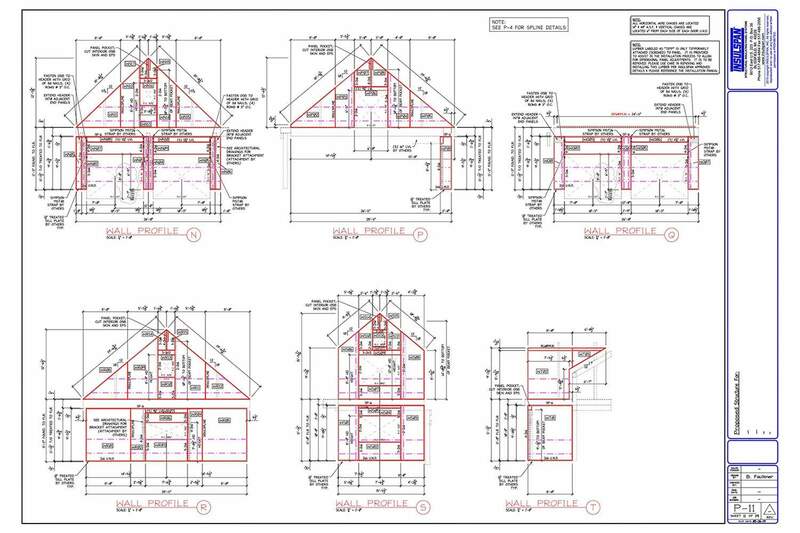 If you have not previously worked with SIPs, Insulspan offers the option to have a technical advisor on your site. This advisor helps guide you during installation. The Insulspan team, many of whom have been with Insulspan for a decade or more, are happy to share their knowledge and expertise with you through this on-site training. Cut-to-size panels with all edge reliefs done and lumber components installed at window and door openings, and corner and structural spline connections. Any lumber components that Insulspan cannot install during panel manufacturing provided to you trimmed and ready for install. 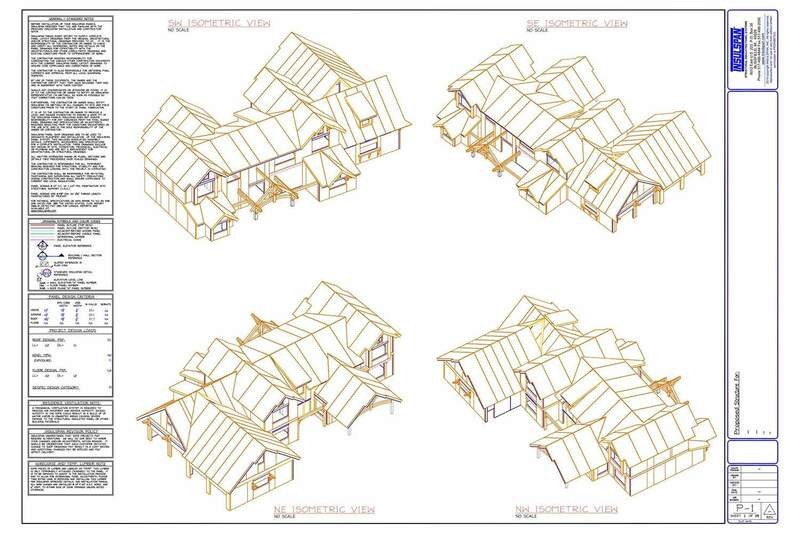 Architectural-grade glulams for ridges, purlins, hips, and valleys cut and beveled per construction drawings. Lifting plates to facilitate safely moving the panels into place. Fasteners, tested for sheer strength, provided based on the thickness of your panel package. Sealant to use during installation at all connection points to eliminate air infiltration. A Dow 2-component, high expansion foam to fill any joints. This foam completely seals your building’s thermal envelope. 6″ panel joint tape for use as a secondary barrier at the wall and wall-to-roof seams to prevent air and moisture movement. 12″ or 18″ joint tape is provided for use at ridge and beam connections. GreenGuard MAX™ building wrap to protect the OSB from any moisture that may penetrate the exterior cladding. Discover the many advantages of Insulspan’s unique SIP building RTA system.